We are continuing to look at arch bridges as we travel downstream along the Seine in Paris. By now it is apparent that the state of the practice in the 19th century for river crossings was a single or multi-span stone masonry or cast iron arch bridge. In London along the Thames and in Paris along the Seine, we see arch bridges as the preferred choice for river crossings. The Pont au Double is a single span, cast iron arch bridge that spans between the Left Bank and the Ile De la Cite next to Notre Dame Cathedral. A bridge has stood at this site since 1634. The current bridge was built in 1883. It is 45 m (148 ft) long and 20 m (66 ft) wide. Its unusual name comes from the toll (a double denier) that was required to cross the earlier bridge. 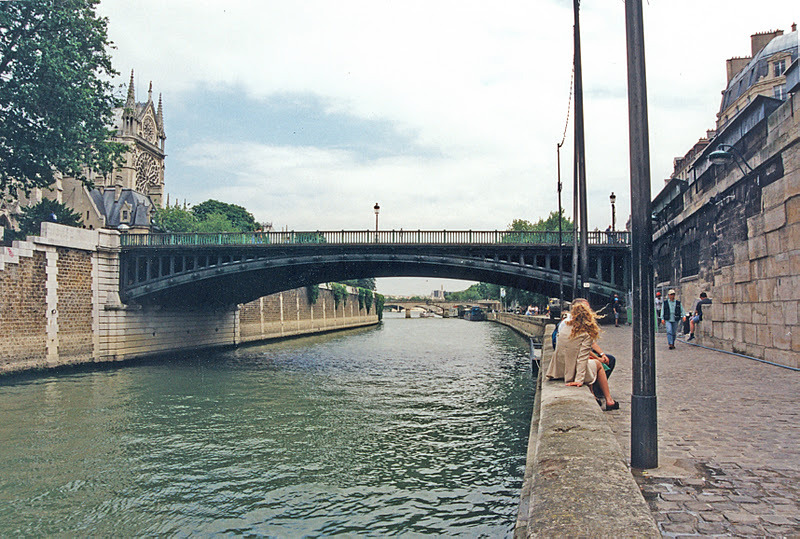 Seine River Bridges: Pont au Double by Mark Yashinsky is licensed under a Creative Commons Attribution-NonCommercial-ShareAlike 3.0 United States License.